Nothing is more disheartening than arriving home after a long day to discover that you can’t get into your garage because the opener has failed. When you urgently need help to get your motor unit checked and repaired, we’re here for you. We’re a team of specialists who are quick to respond to emergencies. We’ll thoroughly inspect your garage door motor and install any replacement parts on the spot to ensure that it’s fixed in no time. Whether a chain, belt, or screw drive opener powers your door, you can count on our know-how to keep it in exceptional working condition. Is the garage motor you’ve been using for years starting to act up? Are you shopping around for a new opener because your current one is too noisy? We handle the process of replacing your opener unit from start to finish. You won’t even need to worry about removing your existing motor; we’ll take down all the old components before installing your brand new model. We supply only the leading opener brands and guarantee that all the accessories we use are approved by the leading door manufacturers. 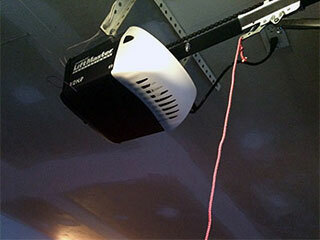 Many of the problems that arise with long-term garage door opener use can be prevented through regular maintenance. We recommend getting your motor checked at least once annually to keep it functioning properly in the long-term. Our maintenance service involves a thorough inspection and testing of all the components of your opener, remote control and wall switch. We’ll make any minor repairs that are required and will lubricate the chain or belt to ensure smoother operation of your door. When you choose our company to help with your garage door opener repairs and upkeep, you have our guarantee that we’ll use only the highest quality of spare parts. We always have the necessary equipment on hand at every call so that repairs can be done immediately. At Overhead Garage Door Minneapolis, we’re your trusted garage door repair specialists. Call us today!